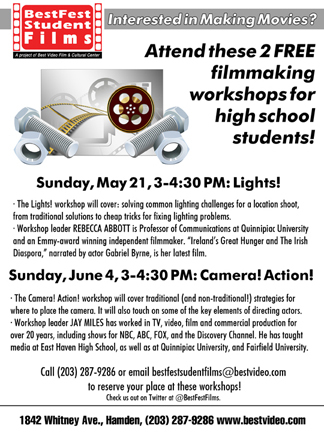 BestFest Student Film Festival, a project of Best Video Film & Cultural Center, will offer a the second of two unique workshops for local high school student filmmakers. Each workshop covers an important but often misunderstood aspect of capturing a scene, led by a local professional expert from the industry. 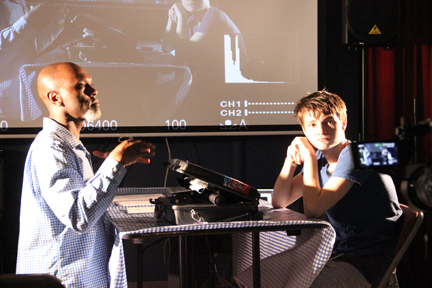 The first workshop, “Lights!”, was held on Sunday, May 21, and led by Emmy Aard-winning documentary filmmaker Rebecca Abbott. The second, “Camera! Action!,” will take place on Sunday, June 4, and will be led by Jay Miles. • “Camera! Action!” (June 4, 3 PM): Jay Miles will detail the traditional (and non-traditional!) strategies for where to place the camera in order to best cover a scene, and address the particular challenges of location shooting. Learn about shot selection, coverage, inserts, wilds and more! Miles will also touch on some of the key elements of directing actors. From rough rehearsal, to the rhythm of calling “rolling, action, cut,” to giving notes and making adjustments. Learn about all of these strategies and more! 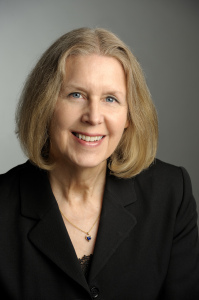 • “Lights!” (May 21, 3 PM): Rebecca Abbott will cover solving common lighting challenges for a location shoot, from traditional solutions to cheap tricks for fixing lighting problems. Learn about balancing daylight and interior light, filling in shadows, tackling power concerns, and more! The 2016 BestFest Student Film Festival screens short films by area high school students this Saturday, Dec. 10, starting at 4 pm. The event—the first in what is planned as an annual event— will be held at Best Video Film & Cultural Center at 1842 Whitney Avenue in Hamden. BestFest Student Films is a project of BVFCC. BestFest Student Films was created to showcase films by area high school students. The festival is open to all high school students from New Haven, Connecticut, and adjacent communities (East Haven, West Haven, Hamden, North Haven, Woodbridge, and Orange). Among the schools represented in the festival are Wilbur Cross High School and Metropolitan Business Academy in New Haven and East Haven High School. 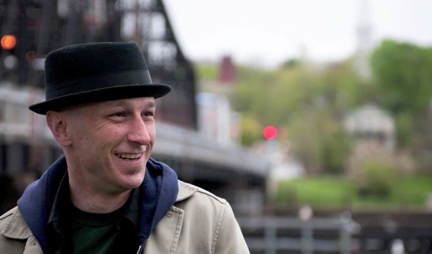 Local professional documentary filmmaker Brendan Toller will give a keynote address. Toller’s second film was picked up by Magnolia Pictures for worldwide distribution this year and was the inaugural offering of Arthouse Theater Day in September. “Danny Says” documents the life and times of Danny Fields, the first manager of The Ramones and a key figure in the 1960s New York City rock counterculture. Beyond presenting students’ films, the festival serves as an educational resource for student filmmakers. BestFest Student Films presented workshops for students in June and November covering topics including pre-production, lighting, capturing good audio, and effective storytelling techniques. 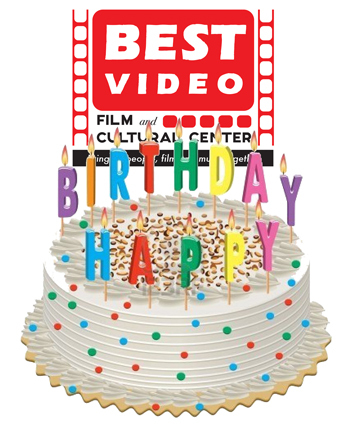 For more information, call (203) 287-9286 or email BestFest Student Films at bestfeststudentfilms@bestvideo.com. BestFest Student Films can also be contacted through Twitter at @BestFestFilms. Information is also available at www.bestvideo.com/student-film-festival/. 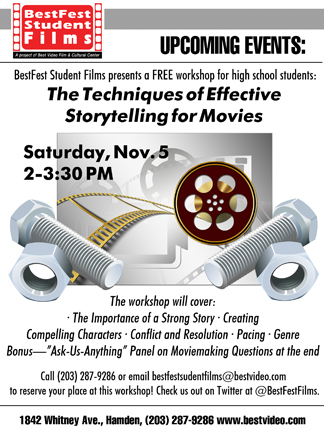 BestFest Student Films, a project of Best Video Film & Cultural Center, will offer a free workshop on effective storytelling in movies for high school students on Saturday, November 5, at 2 PM. The event will be held at Best Video Film & Cultural Center at 1842 Whitney Avenue in Hamden. BestFest Student Films was created to showcase films by area high school students. The festival is open to all high school students from New Haven, Connecticut, and adjacent communities (East Haven, West Haven, Hamden, North Haven, Woodbridge, and Orange). Selected films will be screened at the 2016 BestFest Student Films Festival December 10, 2016. The deadline for submission of films is November 18. Beyond presenting students’ films, the festival will serve as an educational resource for student filmmakers. The steering committee plans to assemble a group of expert volunteers—including film industry veterans and educators—to offer advice on issues ranging from screenwriting to audio engineering, film financing to editing. As part of BestFest Student Films’s educational mission, BestFest is offering a free afternoon workshop on November 5 to acquaint aspiring student filmmakers with the techniques of strong storytelling. Among the topics to be covered include creating compelling characters, plot construction, and genre conventions—both how to work within them and how to use the element of surprise to subvert them. In addition to the discussion of the importance of story as a foundation of effective filmmaking, the group will offer an ask-us-anything panel at the event for students who have questions about other aspects of filmmaking. 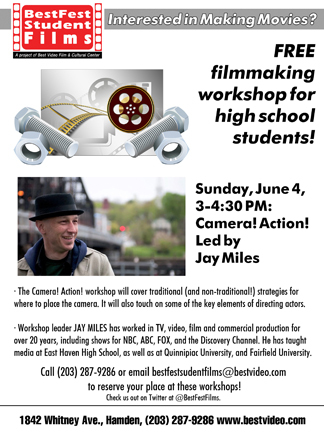 To reserve a place at the workshop, call (203) 287-9286 or email BestFest Student Films at bestfeststudentfilms@bestvideo.com. BestFest Student Films can also be contacted through Twitter at @BestFestFilms. For more information as this festival is developed please visit www.bestvideo.com/student-film-festival/. 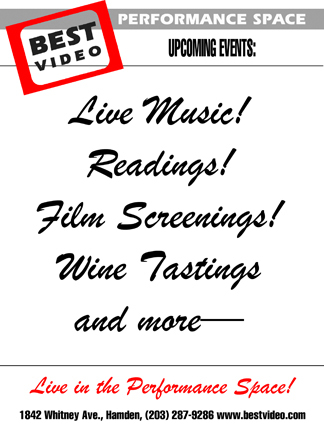 Now that Best Video has successfully transitioned into its status as a non-profit, the Hamden-based video rental store/cafe/performance venue is looking to bolster its value as a practical and educational resource for young filmmakers in the community. The first major initiative that they’re taking to help realize that mission is through the BestFest Student Film Festival, which will offer a venue for high school students from New Haven, East Haven, West Haven, Hamden, North Haven, Woodbridge, and Orange to submit and present their work. Tuesday night’s session, which ran from 7 to just after 9 p.m., was the first step in preparing student filmmakers for that festival, bringing together a handful of experts to share tips, best practices, and a wealth of personal and professional anecdotes. Thanks to Tom Breen for covering this inaugural event for BestFest Student Films. And thanks to our presenters filmmaker Gorman Bechard, Jay Miles (East Haven High School), Robb Blocker (Cooperative Arts & Humanities High School), Rebecca Abbott (documentarian and professor at Quinnipiac University) and Caden Rodems-Boyd (student filmmaker, Educational Center for the Arts). “With the widespread availability of video technology and editing software, movie-making has become an accessible option for young people. We want to encourage student creativity by offering a forum for the screening and recognition of their work,” said Hank Hoffman, BVFCC Program Director. 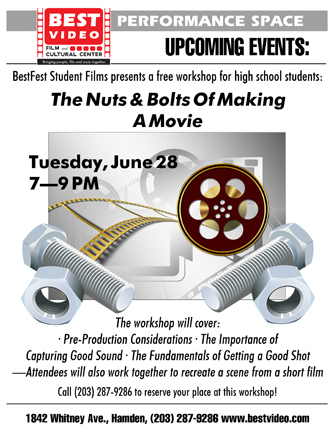 As preparation for the festival, BVFCC will host a session titled “The Nuts and Bolts of Making a Movie” on Tuesday, June 28, from 7-9 PM. Experienced filmmakers will be available to explain the step-by-step process of creating a movie. Among the topics covered will be pre-production solutions, the under-appreciated importance of good sound, and how to get a gorgeous shot with just one light. The second half of the session will consist of a hands-on exercise in shooting a scene, based on an existing short film. Submissions to BestFest Student Films will be accepted through late October with the festival taking place in early November. Entry is free, and students should submit films through withoutabox.com. “We know you have film ideas—now it’s time to make it,” said Caden Rodems-Boyd, a student filmmaker who attends Educational Center for the Arts in New Haven.